With free agency looming in March, roster turnover isn’t far away. However, the majority of the 2019 roster is already in place. In the coming weeks, DallasCowboys.com will feature players who are currently under contract for next season, analyzing their past season and their future prospects. Today, we continue the series with center Joe Looney. What’s Been Good: Let’s be perfectly honest: when it was announced that Travis Frederick had been diagnosed with Guillain-Barré Syndrome and would be unavailable to start the 2018 season, everyone assumed the worst. Yes, Joe Looney had played well in spots as a backup, but everyone saw the way the Cowboys struggled without Tyron Smith the year before. It was logical to assume they would once again struggle to replace an All-Pro offensive lineman. In two years with the team, Looney had already proven himself as a valuable locker room presence. In his third season, he stepped up as a pretty damn capable starter. Looney wound up starting all 16 games at center, as Frederick was eventually moved to injured reserve. To be fair, he didn’t make anyone forget that the Cowboys employed the best center in the NFL, but he also wasn’t the liability that many thought he would be. Looney handled himself well, and he helped bring along two newcomers in Connor Williams and Xavier Su’a-Filo. In 2017, the Cowboys saw the disastrous results of what can happen if you don’t have good depth behind your starters. Looney’s play helped them avoid that fate in 2018. What’s Been Bad: As was already mentioned, none of this means that anyone forgot about Frederick. As well as Looney stepped up, he still lacked the elite ability that made Frederick a four-time Pro Bowler. Frederick possesses rare agility and power that enables him to seemingly always penetrate the second level of a defense, eliminating would-be tacklers from the run game. 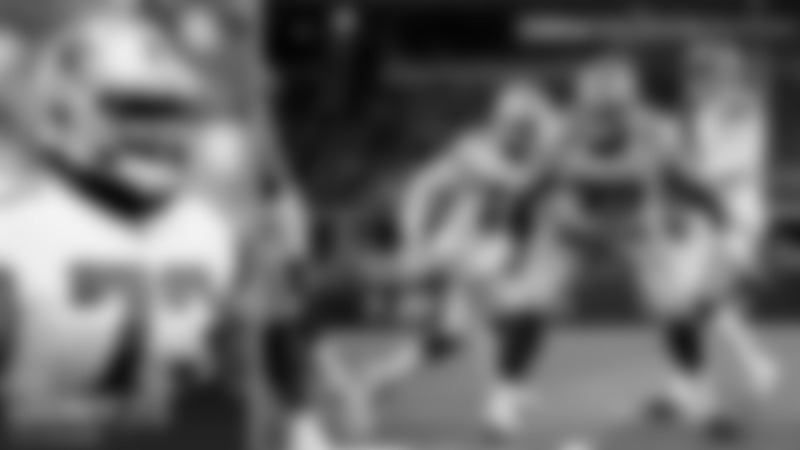 He’s also not a guy who often needs help in double-team blocking, which enables him to handle his assignments and help others with theirs. Looney wasn’t bad by any stretch of the imagination, but there was certainly a smoothness and a power that the Dallas offensive line was lacking without its starter in the lineup. None of this is to say Looney was bad. He played like a backup – which is what he was. 2018 Highlight: Looney has never bothered playing down his size. Last year, he had fun with it, impersonating Ezekiel Elliott in a crop top that was about three sizes too small. Don’t let that fool you into thinking he’s not a professional athlete. For an example, look no further than Ezekiel Elliott’s 38-yard screen pass touchdown against the Lions on Sept. 30. On the play, Looney quickly shed his block to the second level and helped Zack Martin drive Detroit linebacker Jarrad Davis out of the play. From their, he absolutely motored 30 yards to the end zone – out pacing Elliott in the process. When he reached the goal line, he drove two defensive backs away from the ball carrier, allowing Elliott to dive into the end zone. It was a feat of athleticism no one was expecting from the husky center. After the game, Looney stayed true to his style by saying he thought he saw a box of Krispy Kreme donuts in the end zone. What’s Next: This is not intended as a knock toward Looney, but hopefully 2019 sees him return to his role as a backup in the final year of his contract. The word coming out of the Cowboys’ front office is that Frederick is hoping to be ready for the start of the offseason program, and that would be quite a boost for this Dallas offense. If Frederick can return fully healthy, it would give the Cowboys their full complement of All-Pro linemen, hopefully making life much easier on Dak Prescott and Ezekiel Elliott. If that comes to pass, Looney would provide some fantastic depth at all three positions along the interior of the line. And if for some reason he needs to step back into the starting lineup, he’s already proven he can handle it. 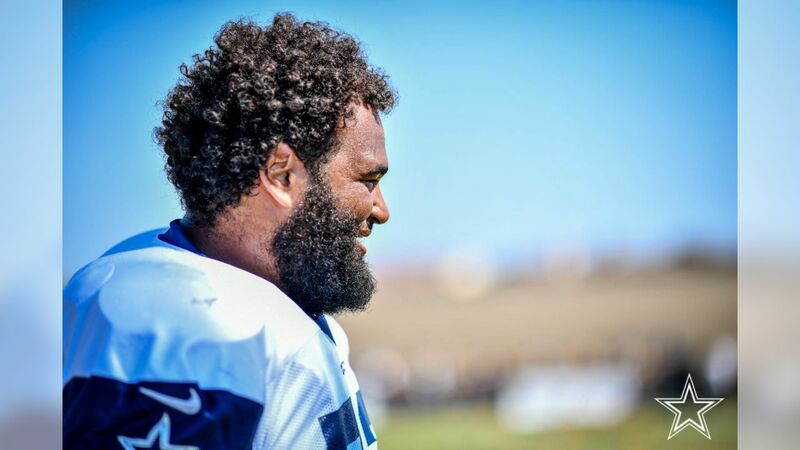 Bryan Broaddus’ Bottom Line: When it was time to hand out my postseason Most Valuable Player Awards – the first player that came to my mind was Joe Looney. It could have been an absolute disaster if Looney had not stepped in for Travis Frederick and played the way he did. For Looney, it started in the offseason with the way he reconditioned his body and was better prepared for the possibility of playing. Looney was in shape and he was mentally stronger, so when that opportunity did come he was ready. All indications are that Frederick will be ready to return to the lineup as the club prepares for the 2019 season, but now we know that if called on Joe Looney will be ready.